Rhombic Crystal Systems are all those that have a diamond shaped inner structure. Rhombic minerals form either Rhombic Crystals like Aragonite, Peridot or Topaz, but sometimes they also form in Hexagonal shapes (3 Rhombuses fitted together that form a hexagon). When they form this way they are called pseudo-hexagonal. 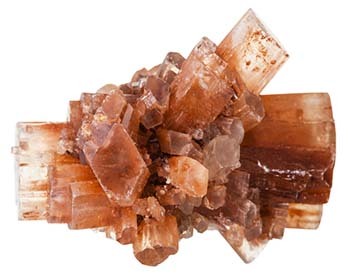 Aragonite would fall into this group. Again we have a shape similar to a square. This lifestyle can also appear to outsiders that everything appears to be in order (Cubic). As a rule, life develops along a continuous line without special events. It is rare that you experience massive intrusions. If you are a Rhombic person, your long cycles of daily happenings, that seem to be very much the same, can suddenly bring you to a low point. And it would seem for no particular reason. You might experience panic attacks, depression or simply bad moods. Just as quick as they pop up, they can disappear without a trace. When these feelings arise (intrusions), things that seemed important until that moment suddenly seem to lose all value and you are able to make far reaching decisions that others will find inexplicable. Without regrets, you may break off relationships, leave your job, move or throw security away. You can suddenly start a new life with a snap of your fingers. This contrast between long, unchanging phases and unexpected changes determines your life rhythm. Basically you adjust yourself to the reality that everything will stay as it is, so you never plan very far ahead. For you, time is something that constantly reoccurs. Every day the sun comes up, it always does, so why would anything change? If something does suddenly change, the very next day your attitude of taking things as a matter of course returns. Yes, recently everything was different, but from now on everything will always be the way it is now. Because of your mind-set, you can find it easy to make decisions. You can buy a new home, even if you don't know how long you will stay, a relationship can quickly turn into marriage, a task done once often becomes a permanent commitment. You have enormous staying power and are thorough in all you do. In a group situation you will do most of the work but will stay out of the spotlight. You are self-sufficient and do not depend on attention, praise or recognition. Since you don't make a fuss about yourself, your appearance and how you behave, you tend to be inconspicuous. You prefer to stay in the background and run the risk of being unnoticed. So much so that after a party you might be asked "Were you there? I don't remember seeing you." This can become a problem if you fit in too well and give up your own interests for the sake of others. Sometimes your urge to fit in can result in an inner emptiness or insecurity that you try to secure holding on to outward things. It is from this disregard of your own wishes and dreams that reinforces the inner emptiness you feel ever increasing until the "intrusion" occurs. Sometimes the recognition that you have not been living your own life for a very long time will cause you to sever the relationships that you perceive to be the cause of the problem. Your desire for ridding yourself of these outside influences can cause the baby to be thrown out with the bathwater. When you turn your life upside down, you also lose the positives you worked hard for. Then comes the risk of running to new dependencies, looking for a new hold until the cycle repeats itself again. The real way out to the start of positive development in a rhombic lifestyle is by promoting your own life, interests, and setting your goals first. This can even begin in the typical Rhombic fashion of being inconspicuous, in fact it is recommended. After all, a young tree needs to be protected until its trunk is strong enough to hold up to the wind. Depending on how this inner hold is created and your confidence is built up, you will be able to make visible changes. It will be interesting to find that the old attacks from the outside will become far more rare than you expect. Actually, just the opposite will occur, and your new decisions will be admired and supported. If an intrusion takes place, it will be easier to tell the difference between a friend or foe. Making a break from someone who does not mean well or turns out to be a false friend will not be harmful. Your new development will make it easier for you to use your own abilities successfully for yourself and for others. Your capacity for understanding and empathy will turn you into a good helper and perhaps a healer. And you won't have to lose yourself in the process!